This is also an opportune time to gift teachers and administrators with flowers or a special gift for helping your kids out throughout the year and guiding them toward success. Our graduation flower collection offers something for everyone that we can hand deliver throughout the Rochester area. 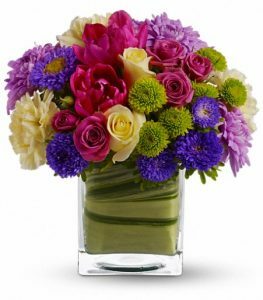 We can also work with our nationwide florist network to also send graduation gifts and graduation flowers to loved ones throughout the country. This vibrant graduation flower arrangement includes an array of gorgeous and fresh flowers for the big day. It comes in a leaf-lined vase. 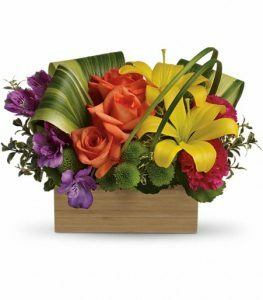 This stunning flower arrangement for graduation includes roses, lilies, and alstroemeria in a bamboo box. 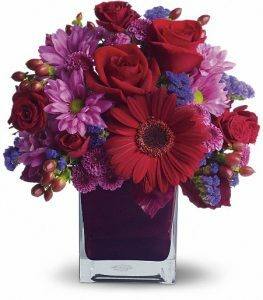 This brilliant flower arrangement design offers shades of red and purple in a jewel-toned cube vase. 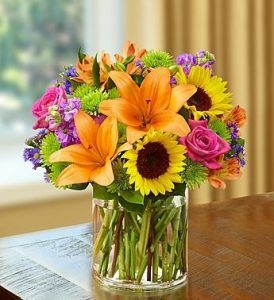 This flower arrangement for grads offers sunflowers, roses, and lilies in a glass vase. This graduation bouquet comes in a recycled coffee bag and offers a grouping of cheerful, fresh-cut flowers. This summer flower arrangement welcomes the season with asters, daisy chrysanthemums, and carnations in shades of red, orange, purple and yellow. These flowers come in a ginger vase that has been wrapped with a green plaid bow. 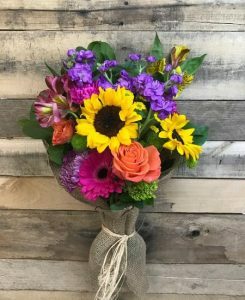 Order by phone, in our Rochester flower shop, or online through our website today!